A strong UCD starting line up built up the pressure on Maynooth to end with a comfortable win. 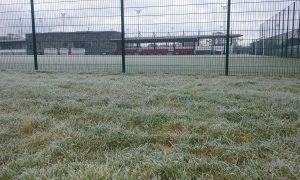 After low temperatures across the North overnight, the expansive Queens Sport campus on Upper Malone Road was covered in a blanket of frost. 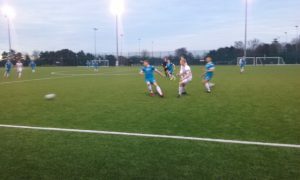 But the Queens Sports staff were able to get one main 4G Astro pitch ready and while one 11am match was postponed until lunchtime the Tournament started on time with DCU beating Ulster University 5-1 during the morning session. UCD’s game was first pushed back to 4pm from it’s original 2:30 but a second postponement until 4:30pm was necessary to wait Match Officials from the finish of Queens University v Trinity College. Both teams started brightly showing no effects of the disruption to their preparations. Early in the game UCD crossed the ball into the box three times in succession and the third time Georgie Kelly put his head on the end to put the ball over. Jason McClelland was next up with his run down the right wing and shot at goal, at the other end Liam Scales at left back was at his best in blocking shots and clearing out with his head. In may have been a case of star-struckness when Maynooth’s goalie Michael Kelly threw the ball straight out to Daire O’Connor who chipped the ball towards the empty net but the ball came back off the underside of the crossbar and out. After McClelland put a free kick wide, Yoyo Mahdy broke out of defence and swept the ball wide to McClelland who’s shot from outside the box was just over. Scales was getting involved in the opposition box with a header just wide. It was all UCD now and the opening goal came when a deep ball by Timmy Molloy to Kelly who scored from close in, on the toes of the Maynooth keeper. UCD 1 nil up. The second half offered the same as the first with Georgie scoring his second from a cross from the bye line. O’Connor put the ball in the net a few minutes later but was ruled out, however he was not to be denied when from the edge of the box he stroked a clearance home. In between regular Intermediate ‘keeper Gavin Sheridan had to at his best to punch away a long range shot from Maynooth. 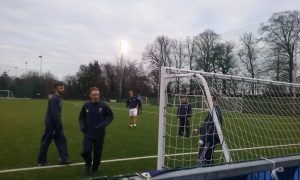 UCD Manager Diarmuid McNally Brought on subs and the team continued to control the game til the end. 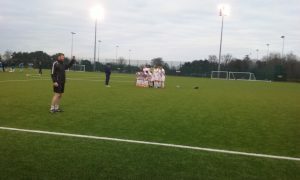 A good start for UCD who play DCU in Tuesday’s Semi-Final. 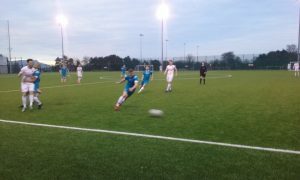 UCD: Gavin Sheridan, Dan Tobin, Liam Scales, Maxim Kouogun, Josh Collins, Gary O’Neill (c), Daire O’Connor, Timmy Molloy (Gregory Sloggett), Georgie Kelly (Sean Byrne), Yousef Mahdy (Gareth Coughlan), Jason McClelland (Colin Feeney). © 2019 UCD Supporters Blog.